Want to grow gourds, but don &apos;t have a lot of space? Harvest Wings Bush Hybrid has a compact growth habit and yields lots of small gourds in a blend of shapes, textures and colors. Instead of having a vining habit like other gourd plants, Harvest Wings has a mounded plant habit and grows just 20-30 in. tall with an 18-24 in. spread. Its gourds may be smooth, bumpy or with deep wings and range in color from green to orange to yellow and to white. They &apos;re eye catching in fall displays and decorations. 90-95 DAYS. FoliageGreen foliage-in a semi-bush form, rather than a vine. 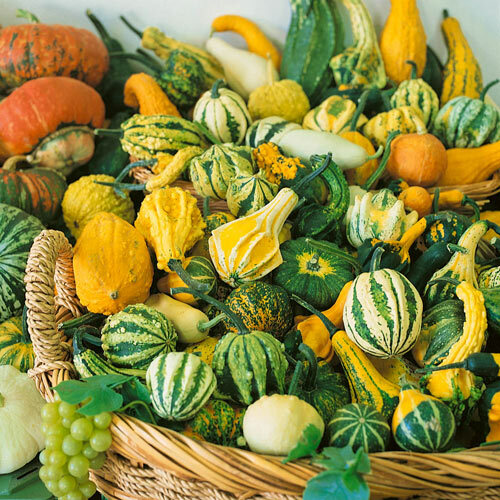 FruitSmall gourds in a variety of shapes and textures in shades of green, orange, yellow, and white. CommentsCreate a fun fall display with these charming gourds! This blend of small gourds includes a variety of shapes, textures, and colors in shades of green, orange, yellow, and white. Some are smooth, some bumpy, and some with deep wings. Instead of a vine, these gourds are produced on a semi-bush plant that allows for high yields in a smaller space.